It saw use on Sunday 16th Oct, top and tail with the steam loco on the service train due to the derailment of 37037 at Totnes. Both 20’s worked without fault over the November gala weekend, although 110 had to take some fuel from the tank on 25901. Some 55 watering cans! Been used for the shunt releasing over the Santa train season. Through January the loco has had it’s compressor oil changed and brakes adjusted. Both 20’s had a check over on Sunday 30th October ready for the gala the following weekend. On the gala Sunday 6th November both 20’s worked in multiple top & tailing with 37037 from Buckfastleigh to Staverton as the line was closed between Staverton and Totnes due to flooding. Over the weekend of 3rd & 4th December two battery cells were found to be going down, so on the Sunday two secondhand cells were fitted. Then the loco put on charged for a short time before starting. Two more cells went flat a matter of days after this and again they were change fore two nearly new cells. And yet again one more cell went and was changed. Fingers now crossed! On Sunday 9th Oct the valve spring were re-fitted to the heads. The heads were now ready for re-fitting on the engine (after painting). Also on this day the pistons had their ring fitted and again they were ready for the loco. Sunday 13th October was meant to have been the day the pistons went into the engine, but only one made it! 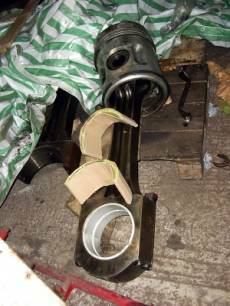 It was found that the new bearings (that came from the Bodmin Rly diesel group) were too big! A return trip to exchange these for some the right size was made the following week but only one set was found. It is now thought that the bearings that are to big where a duff batch that were put to one side at Eastleigh Works, but then pick up by the Bodmin group at a later date. On Tuesday 17th January the new bearing arrived and were checked over. A good day on Sunday 29th, the loco had it’s pistons replaced with the new bearings. Sunday 9th Oct was a busy day, as the triple pump was taken out of the engine room in readiness for it to be examined and freed up. 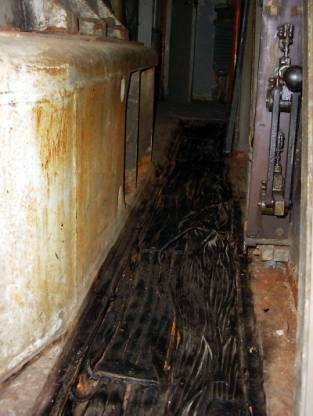 With the triple pump removed from the walkway in the engine room the floor panels were lifted on this side so the cable run could be examined, cleaned out as best they could be and sprayed with black wax oil. Also on this day the body side skirt (which is to be re-placed) had the last of the welds cut away. On Sunday 30th October the floor panel were cleaned and the locks oiled. Also this weekend the roof catches were freed up & oiled and the cab front had its headlight re-fitted along with two handrails and the four securing bolts. 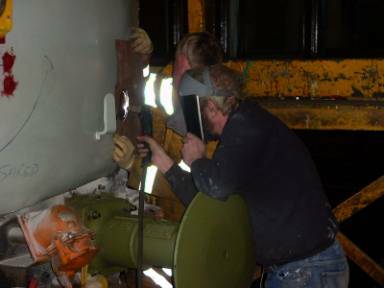 A new set of buffers was fitted to No.1 end on Sunday 6th November. The No.2 ends are ready to fit but need a space between the loco and the box van next to it. Through the week Dave the welder has cut the holes for the small marker lights over the buffers plus had a go at fitting some cab windscreens without much luck. 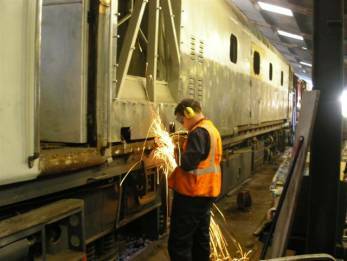 Over the weekend of 19th/20th Nov a start was made on removing the lower five inches of the body side so the new pre-formed lengths could be welded in, not before any rust & muck could be removed from in behind. Also this weekend the beading around the cab windows was replaced with new. 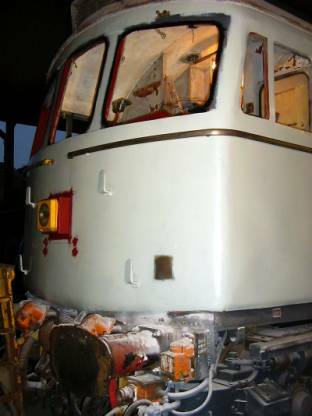 By the end of December the body sides had been finished and work turned to the body side doors, after these have been finished all that will remains to be done is the No.2 cab. Over the Christmas break the drivers & secondmans droplight windows were refitted to No.1 cab but still need a bit of work done on them. The internal gutters, which are full of rust holes, have now been cut away for new to be fitted. Sunday 22nd Jan saw the No.2 end buffers changed for a newer set. The engine room is now getting a coat of undercoat. Was in service but now keeping the class 37 company on the P.L.O.G. shed road, having the leaking oil seal repaired on its fluid flywheel. Was charged up over the last weekend in October, but when an attempt was made to start the engine on the Sunday, it failed to start. The engine would not turn over so this would seem to be a battery fault or a sticking start relay. The loco became derailed at Totnes on Sunday 16th Oct, whilst running round its train. The following Saturday the loco stayed on the rails and worked five round trip for the last driver experiences for this year. In November the loco suffered from flat batteries, after the lighting switch was left in! 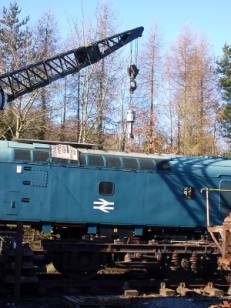 The loco has now been stored for the winter at the back of the P.L.O.G. shed road. 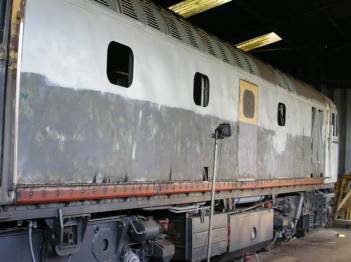 Work has started in January to refurbish the second cab. It had a quick repaint the week before the November gala, but not the whole body was done! The Hymek look-a-like, but the painters did not get it 100% right! The brake van end cab is all but finished with new flooring. The other end cab has had its window rubber replaced. Ran over the November gala, but cur come to the heavy rain as water got into a control box. This was cleaned out by the driver but after three hours it was shut down and left at Bishops Bridge. Waiting for next years timetable. 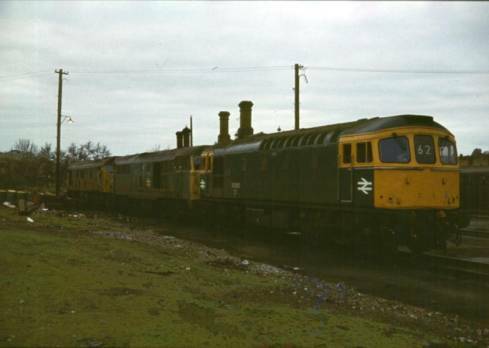 33002 on Exeter HS in the late 70’s with a less powerful class 31 and a class 25 at the rear. 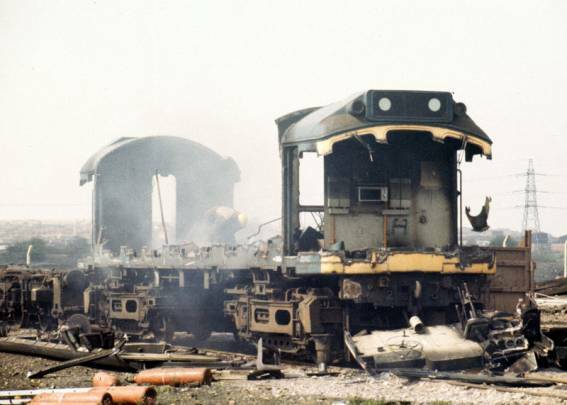 25062 Comes to an end at Swindon Works 26-4-85. 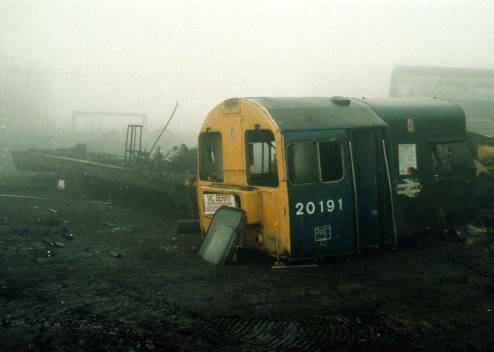 It was withdrawn from Carlisle on 20-12-82. The cab front coming together on Sunday 30th October and the cable run passing the battery switch. Dave, the welder cutting one of the marker lights holes. The new shells fitted for checking & back into the loco they go.